Hollywood and The Chick were in Hawaii taking some well deserved time off with family and friends. The trip involved birthday celebrations, surfing, tasty shrimp trucks, swimming with dolphins and turtles, kayaking and, yes you guessed it, some Hawaiian Fried Chicken. 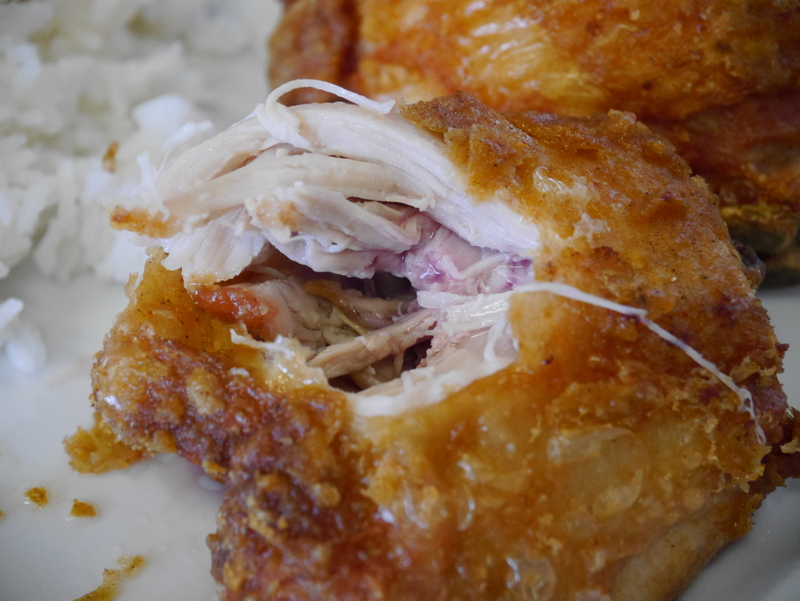 We made time for two tasty excursions for Ono fried chicken and the more classic southern style. 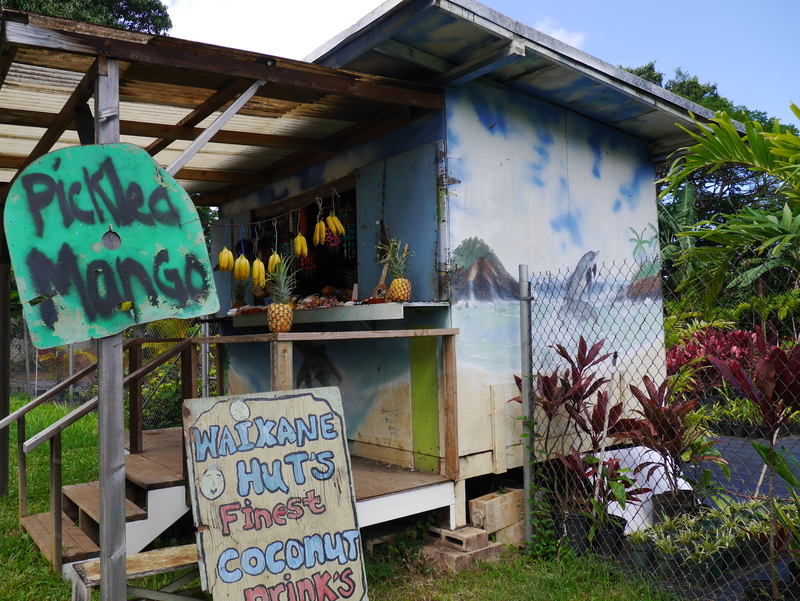 We were staying in Hau’ula along the Eastern shore of Oahu. 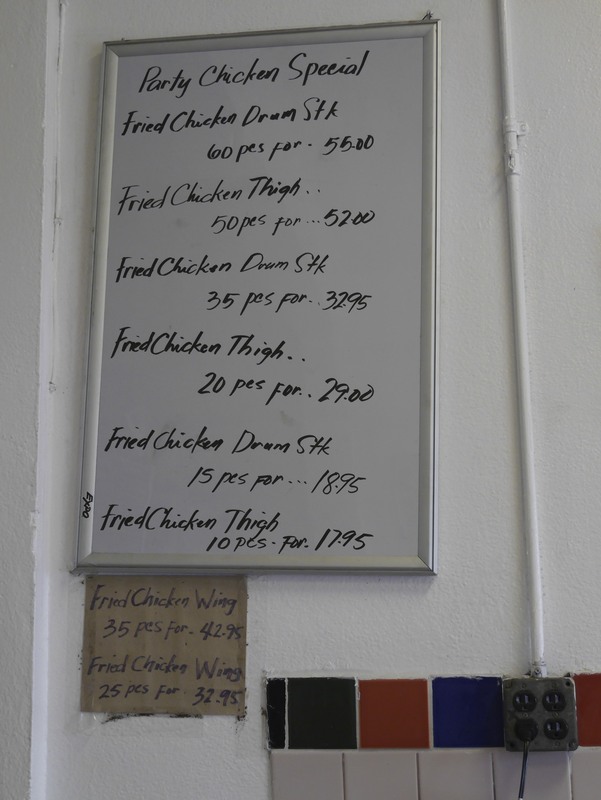 We noticed an “Ono fried chicken” sign on the Kamehameha Highway and we decided to see how it compares to our beloved Melbourne Fried Chicken. We asked for an order of the fried chicken to share and skipped the spam sushi which was also on offer. 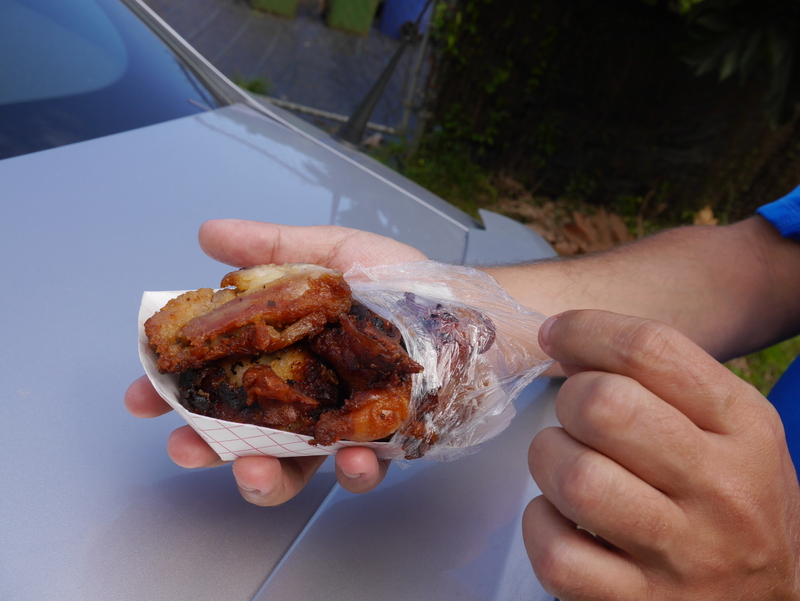 It was served in a small paper container consisting of 4 small thigh pieces with plastic wrapping. 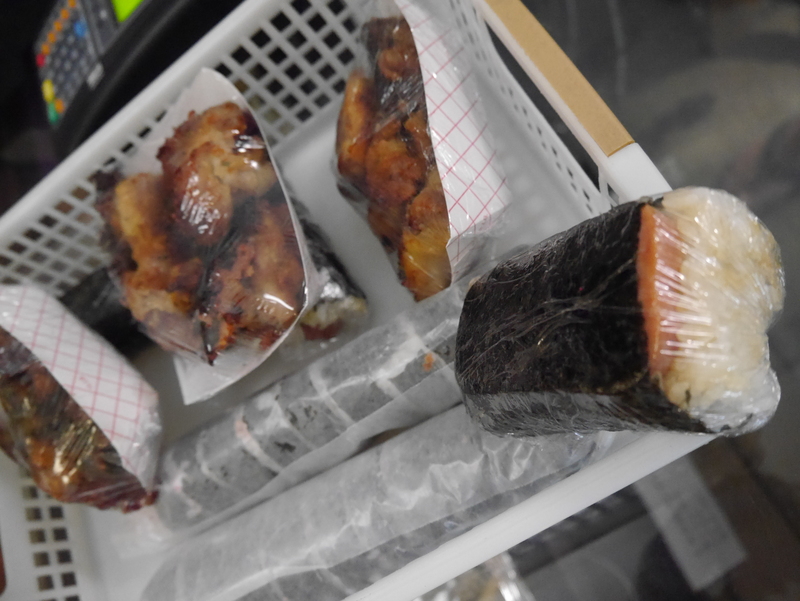 “Ono” Fried Chicken wrapped up in the s basket with the Famous Spam “Sushi” – that ain’t a slice of tuna! 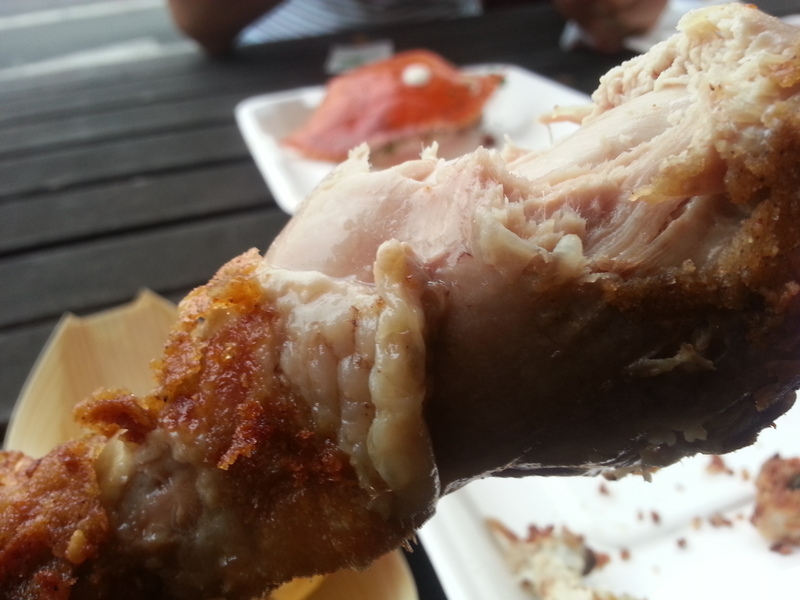 The deboned chicken seemed pan fried because the bottom was a bit blackened and crispy compared to the top. 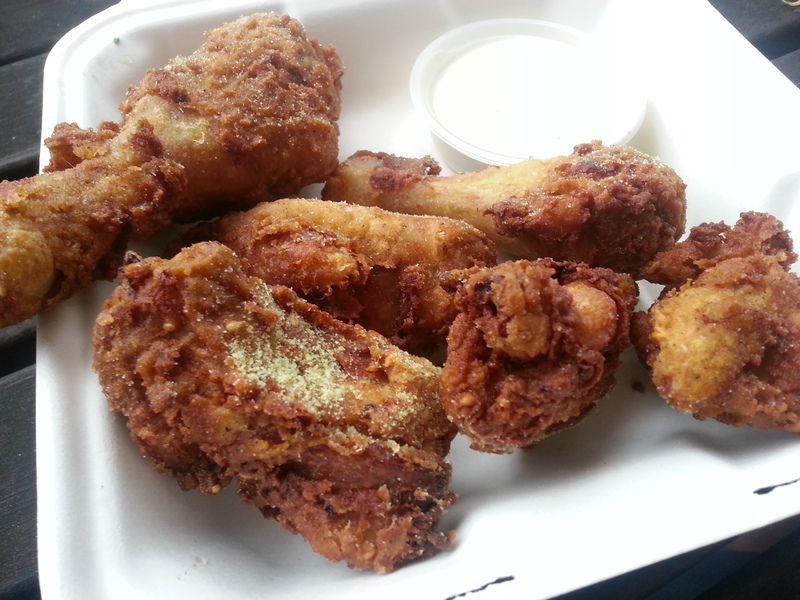 The chicken pieces were the right amount of greasy and had a bit of a sweet taste which we enjoyed. It seemed to be cooked earlier in the day and reheated but that didn’t stop it from being full of yumminess. There was no seating – so we ate on the boot. A sweet piece of Korean? Fried Chicken. We were told that the recipe is an old Korean family recipe but it didn’t seem like any Korean Fried Chicken we’ve ever had. The Chick felt it tasted more like roasted chicken than fried, probably because the skin wasn’t very crispy. 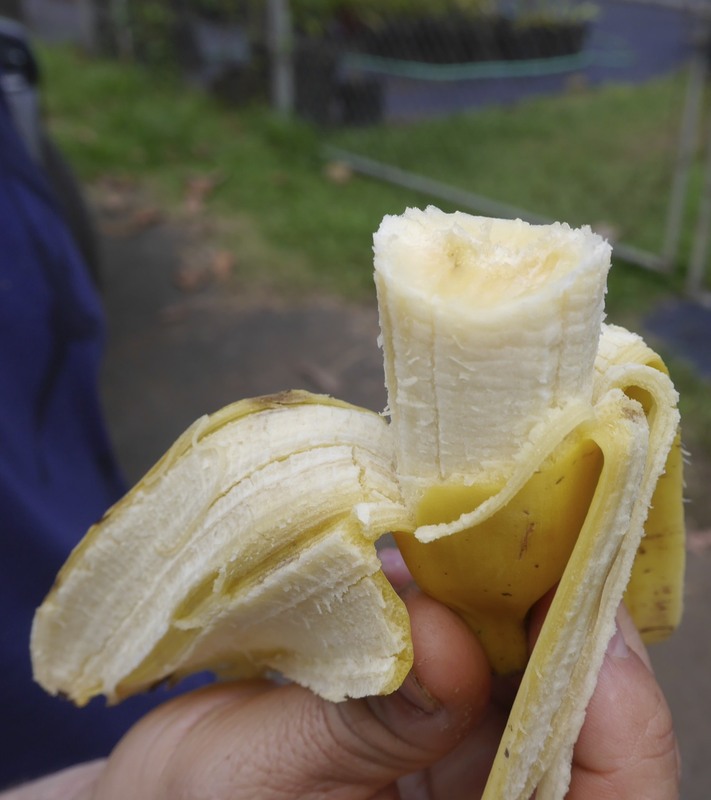 We paired the savoury chicken with a couple of sweet bananas from the near by fruit stand which had an authentic roadside stink of old cigarettes and was run by a gravelly voiced old woman. 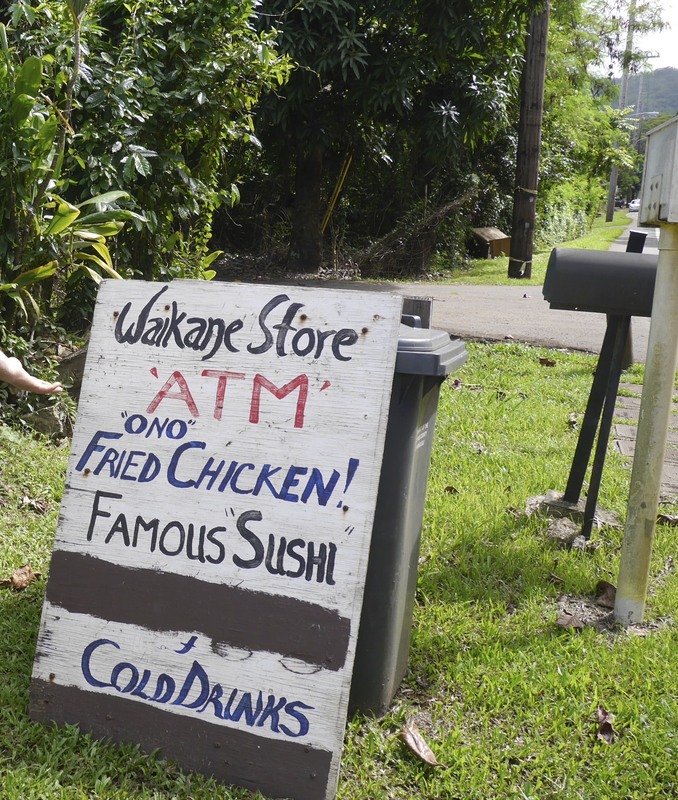 We definitely recommend grabbing a quick cluck from this road side market if you are travelling the East coast of Oahu. Roadside fruit stands were our favorite stops on this tour. Just watch for wild cluckers when parking, they need those for the next batch. We came to know about Ray’s Cafe through the webby web (Yelp) and after reading so many positive reviews we decided we had to get a taste of their fried chooks. Door Open = Open. Door Closed = Closed. Gotta love the simplicity. 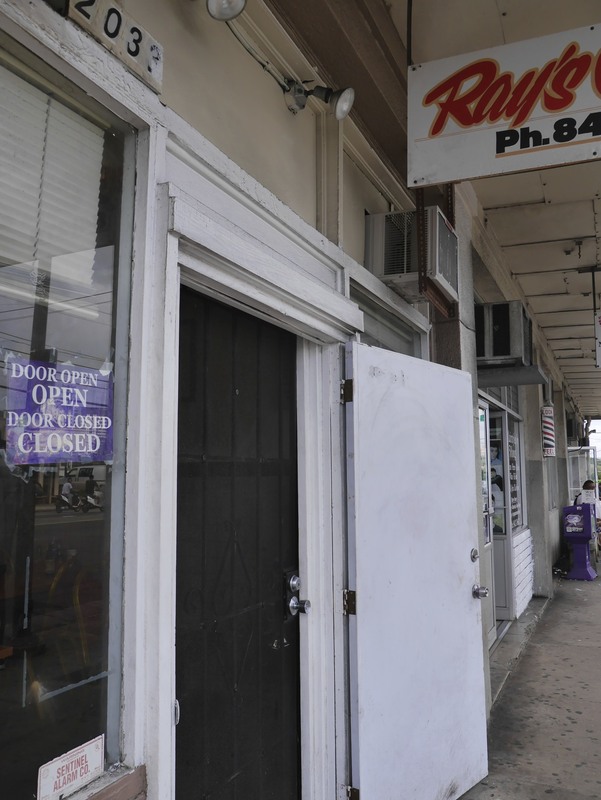 Ray’s is located on North King St in Honolulu in a very local neighbourhood with no parking. It’s a hole in the wall with humongous portions sizes. 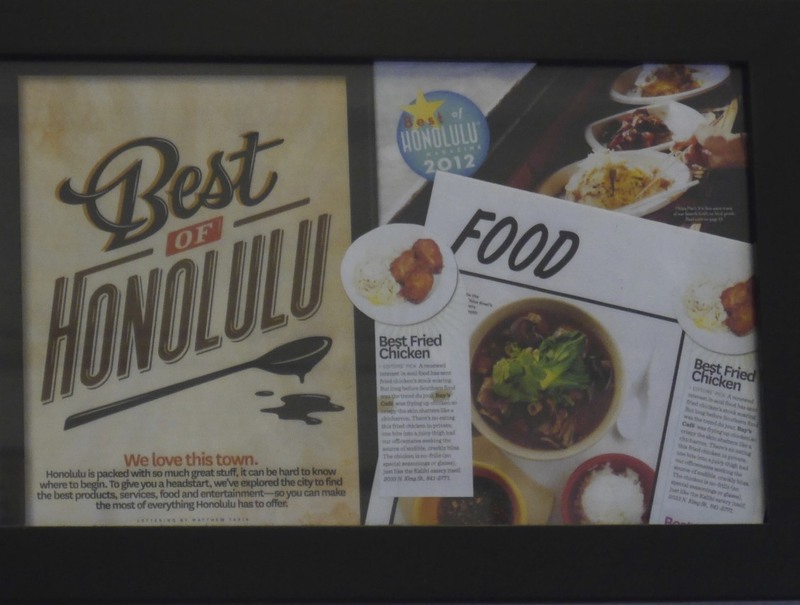 The menu on the wall boasts the best of diner fare: greasy breakfast plates, steaks, ribs, burgers, ahi tuna steaks, a lobster special, and of course – fried chicken. There were options for family-sized buckets, but we opted for a single serving. The Specials all sounded wonderful and looked filling. We opted for the small portion – without the Hamburger Steak. While waiting for the main, we received a bowl of fresh, crisp lettuce and a squeeze bottle of ranch dressing. The Chick was thrilled as it satisfied her craving for green foods. 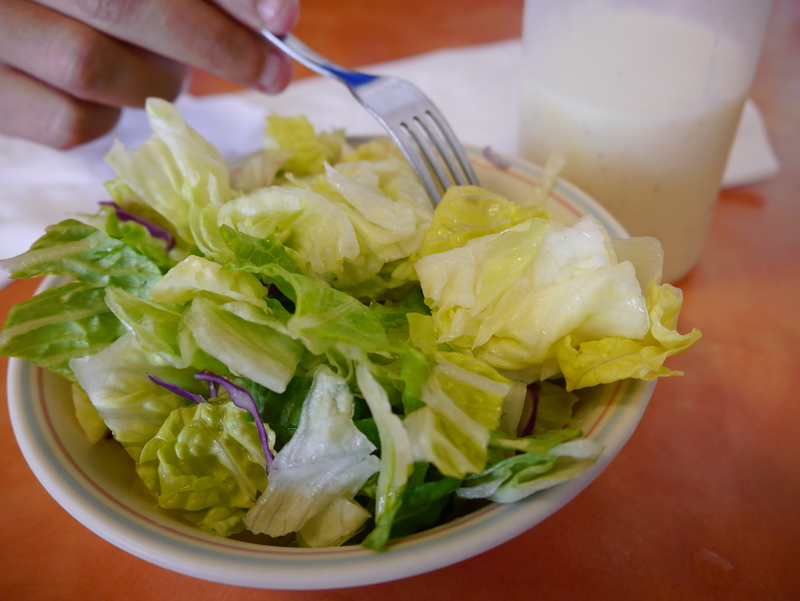 American version of a salad – we skipped the bottle of ranch dressing, and found the lettuce was crisp and refreshing. While waiting we saw plates of ahi tuna steaks and macaroni salad (Hawaiian specialty) go by and watched a man dig into a huge steak with classic crinkle fries in a basket. 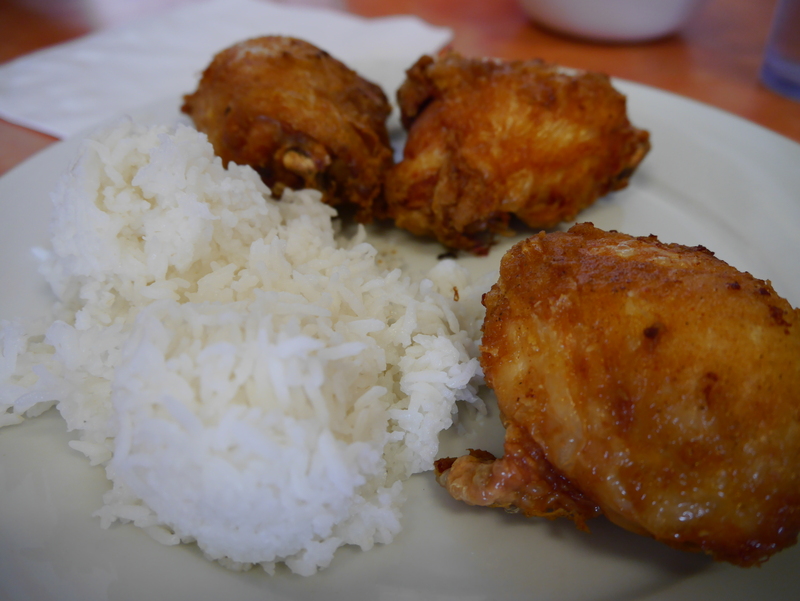 The chicken can be paired with steak, but our order of fried chicken consisted of 3 big, very hot, thigh pieces with two mounds of white rice. 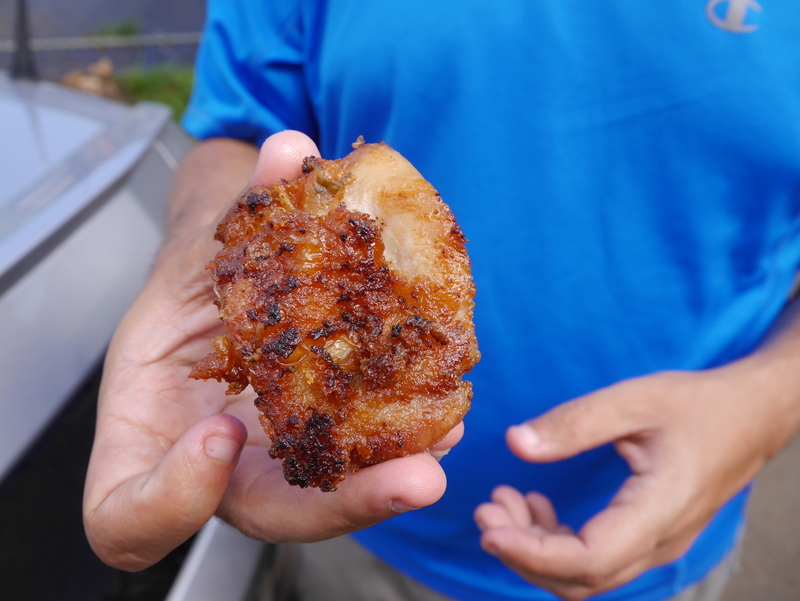 The chicken was single coated and very crispy, almost no breading, but the skin was perfectly fried. It was so hot that we had to let it rest for a bit to cool down. We struggled between burning fingers and the desire to bite in, and in the end had to use a fork. Extra points for truly fresh cooking, it was worth the wait. We added a bit of tabasco sauce to get a bit of kick, but the chicken was tasty on its own. 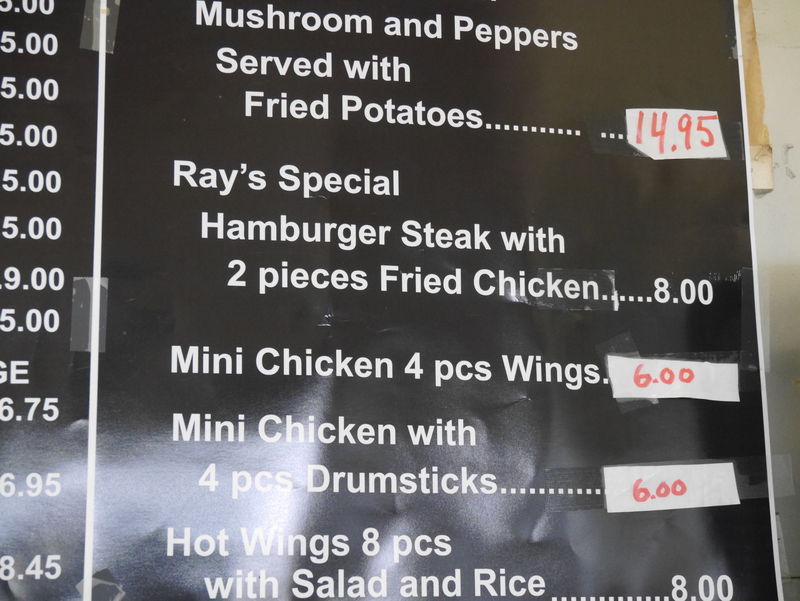 Overall the pieces were big, juicy, and steamy and we enjoyed our experience at Ray’s. Hollywood has his eyes set on the Ray’s ribs and cheeseburgers for the next visit. The rice was perfect – and the chicken was finger burning fresh. 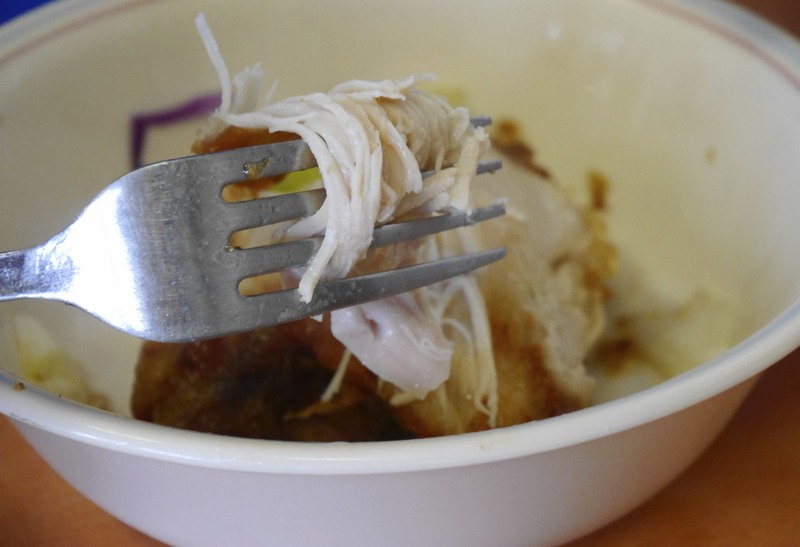 The chicken was so hot we had to resort to a fork – the chicken came off a bit stringy, but didn’t taste dry. The skin was not overly spiced, so a little hot sauce kicked it up a notch. Plenty of hot chicken and very crispy skin. 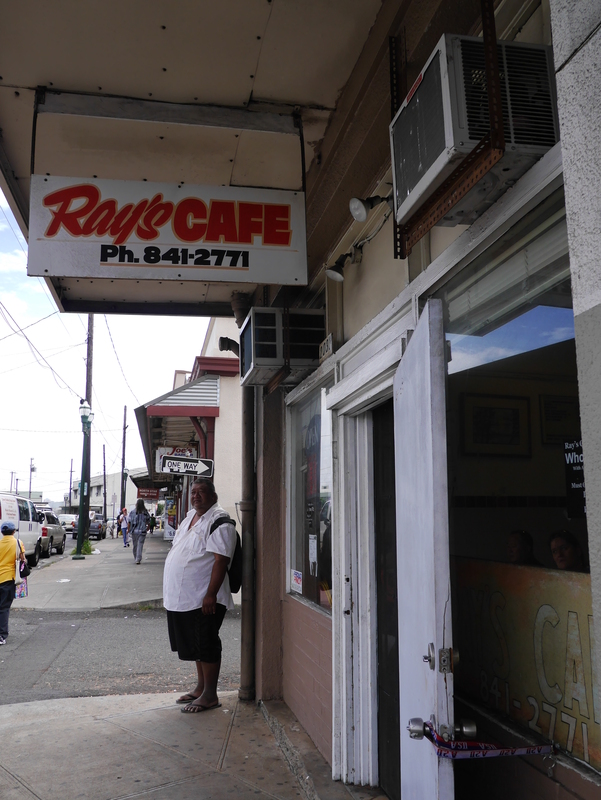 Ray’s is like a Classic American greasy spoon with Hawaiian and Asian touches which all made for a unique culinary experience. Certainly worth a trip off the beach, but beware, you may lose your beach-ready bod along the way. 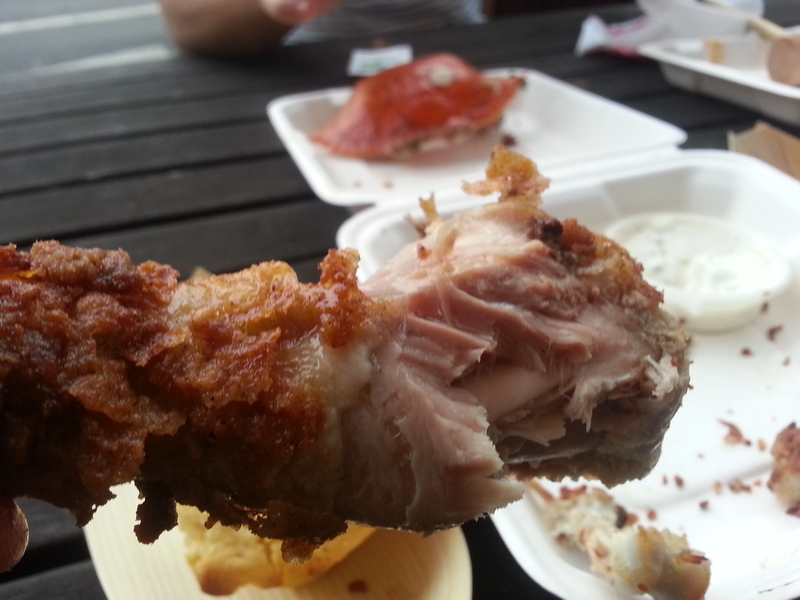 Hollywood and the gang went to check out Miss Katie’s Crab Shack and see how she ranks in the Melbourne Fried Chicken scene. Miss Katie’s was formerly known as Dr Juicy Jay’s. Dr. Juicy Jay’s did rank well when the chicken scene hit it up for a review the first time so we were very eager to see if Katie could do better than the Doctor. We ordered a whole bunch food consisting of the buffalo wings which were on special, the bucket of prawns, the crab, and the fried chicken. The wings were really good however seemed to be overpriced standing at 16$ for 6 full wing pieces, seriously, what the falafel?! We were turned off by the prawns being cold and they no longer were served in the chili lemon sauce that the doctor perfected. The crab boil was ok for what it is, but moving on it was the chicken we were here to cluck. 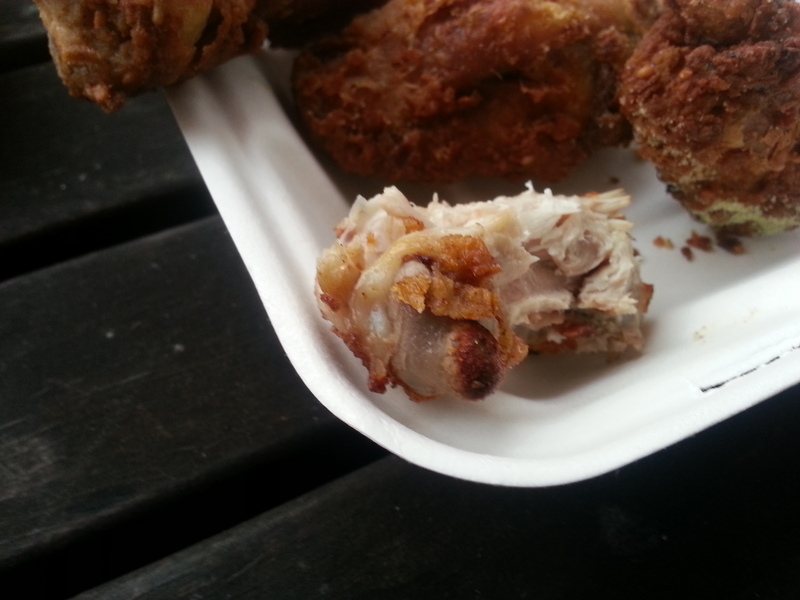 The chicken no longer came as a sea of tender pieces but rather 6 pieces of chicken on the bone. The spices were good however Hollywood was majorly disappointed to find out that the drumstick wasn’t properly cooked all the way. Parts of it were on the raw side and very chewy. This was a first for the chicken scene. 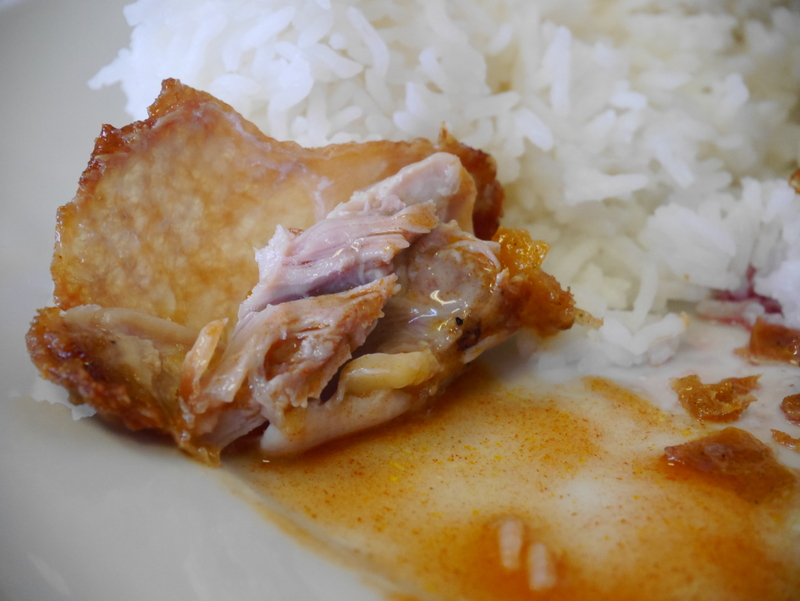 Conclusion: Out of all the places we reviewed so far none have served us uncooked chicken. Miss Katie, you need to shape up because the magic the Juicy Dr had going for the crab shack seems to have disappeared! Mr M. menus each came with different pop culture icons on the back. 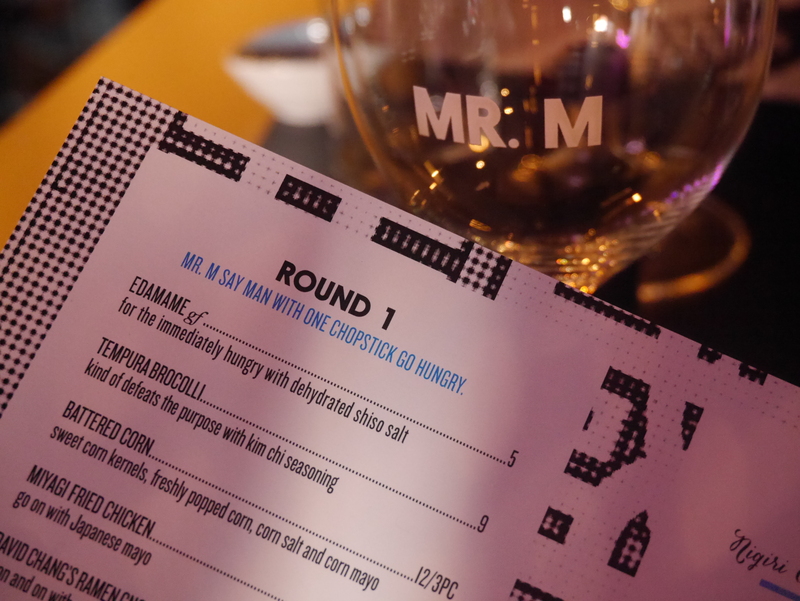 Mr Miyagi is Chapel street’s response to Asian fusion style restaurants like Chin Chin and Miss Chu. Its style can be categorized as modern Japanese. 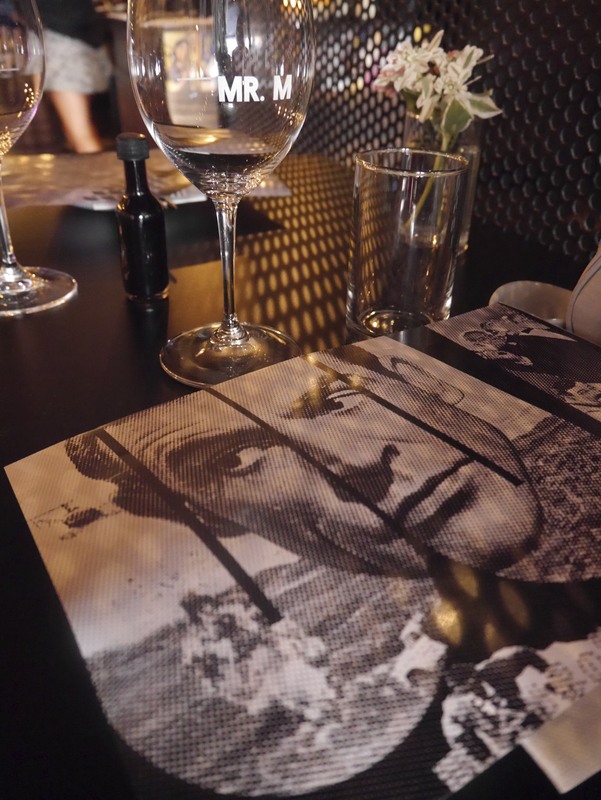 The place is funky and stylish with more tapas size servings. 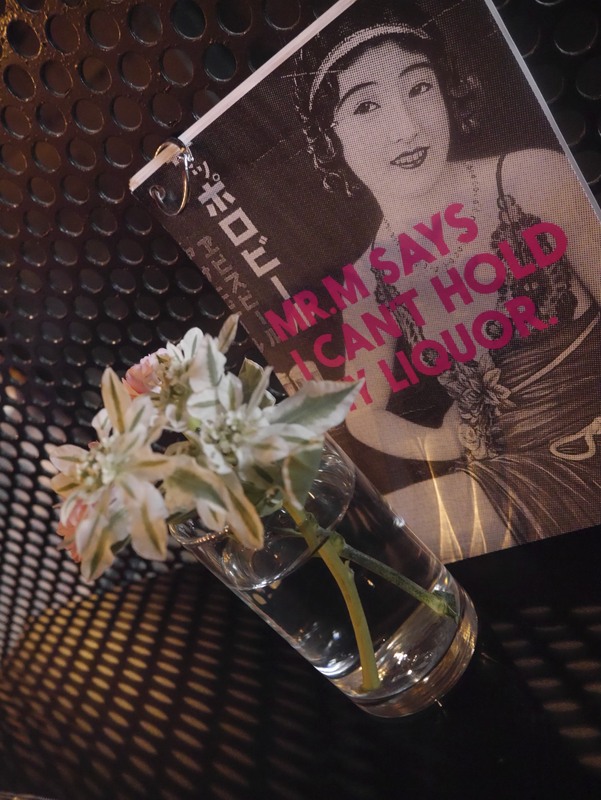 It also boasts a modern bar atmosphere with its fancy cocktails and fun stylish artsy decorations. We arrived and immediately ordered drinks plus a few starters to get us going while we waited for our comrades. 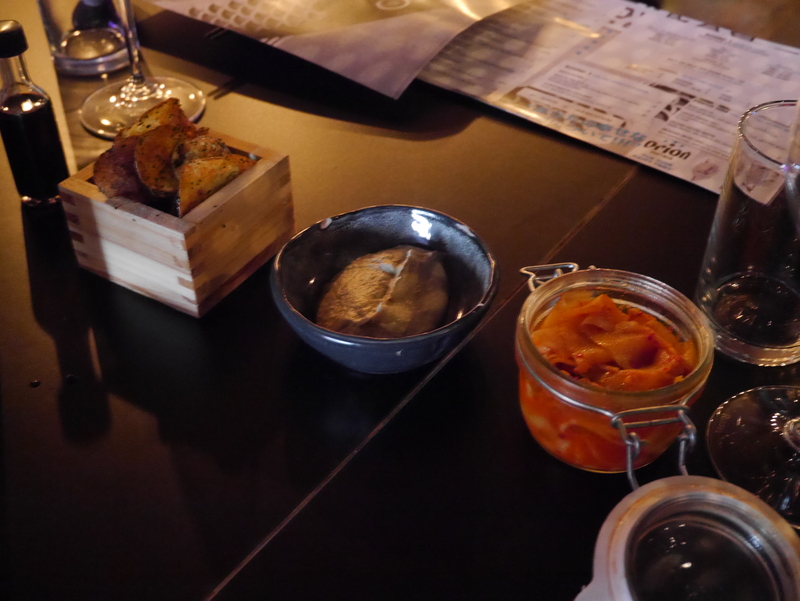 The starters were a serve of Edamame with dehydrated shiso salt, spicy pickles (kim chi) and some sweet potato crisps accompanied with an eggplant dip which sat well with all of us. 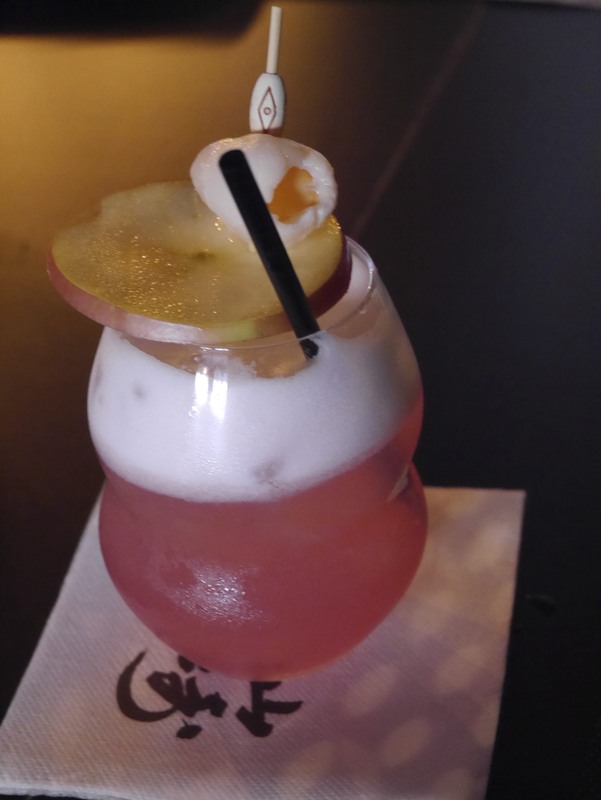 The Chick ordered a Hello Kitty Sour (Lychee and Vodka) drink which was topped with egg white and served in a funky glass. Not too sour, but a tasty beverage. For our mains we went for two orders of the 6 piece MFC (Miyagi Fried Chicken), Black Pig Gyoza, and mushroom skewers. The mushrooms were juicy and full of good flavours. 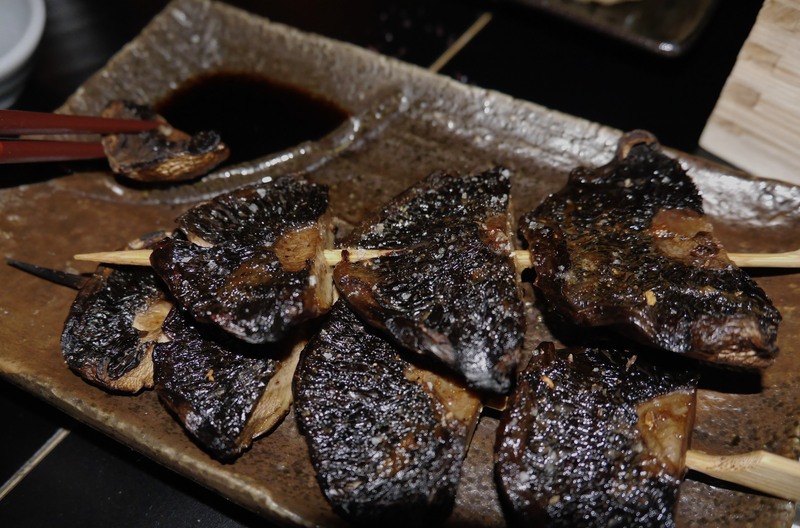 The black pig gyoza had a more meaty texture than typical gyozas which we all enjoyed. The Chick beat back the competition and claimed the fifth black pig on the plate. 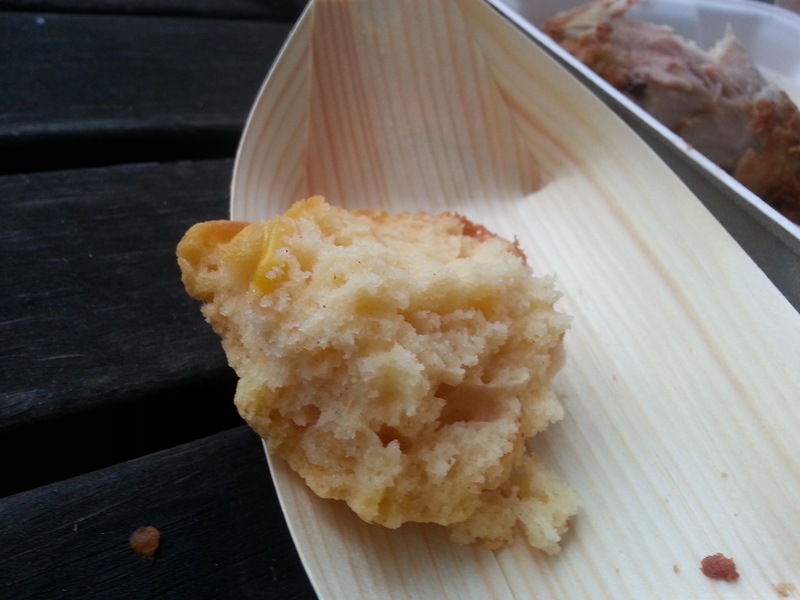 The MFC came in a take away container for extra character and consisted of 6 small wingettes and drummettes. It was cooked fresh, hot and steamy but wasn’t spiced at all, bummer! MFC came with a side of japanese style mayo which did a bit more flavour but certainly made the chicken heavier and a touch sweet. The serve was on the smallish side which didn’t sit well with the Cluckmaster. We still felt hungry so we went for a large order of Nigri and Sashimi combo which was more shashimi than sushi (only 3 on rice). 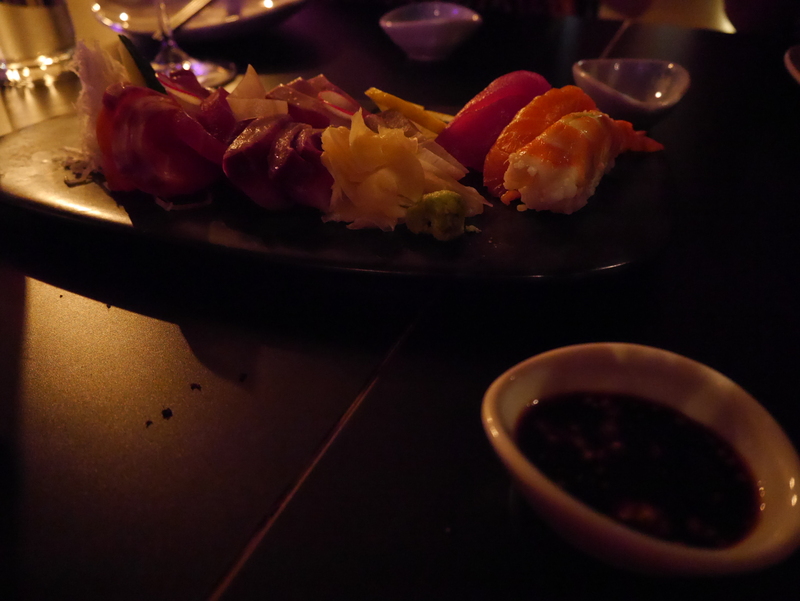 But overall was good and the Japanese kingfish was very fresh – the only one that gave the Chick flashbacks to Tsukiji Fish Market in Tokyo. We finished off the night by ordering Miyagi’s apple pie made with granny and fuji apples, nashi pear and creme fraiche ice cream and the Kabocha pumpkin toast which was a white chocolate and pumpkin ganache, honeycomb, yoghurt sorbet and pumpkin ice cream. 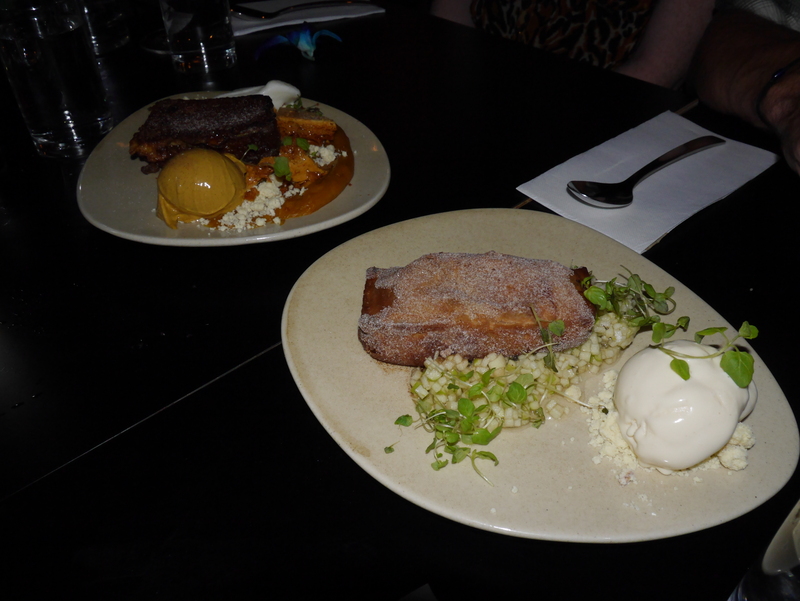 Both desserts were really good especially the Kabocha pumpkin toast which offered a tantalizing array of rich pumpkin flavors. The Chick was in heaven with the flavors of autumn dessert that reminds her of Thanksgiving. Round 4 – Finish Him! 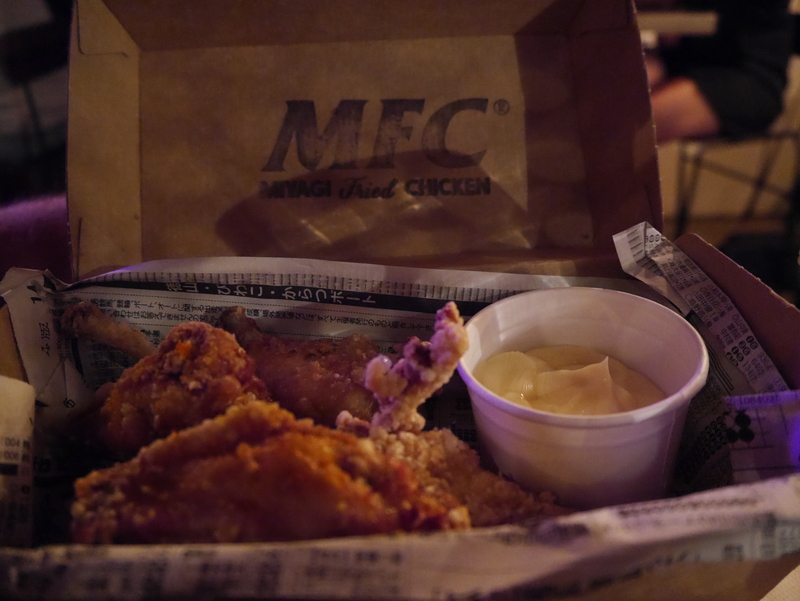 Overall, Mr. Miyagi’s is a cool joint to hang out at however it’s chicken is not the best in Melbourne by our standards. It is worth it if your an in the area and are feeling a funky atmosphere. 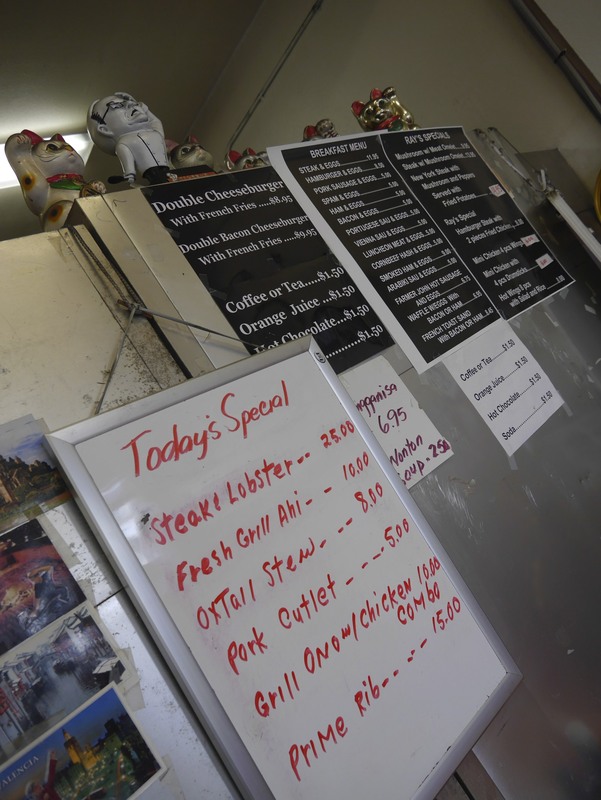 Having said that we still think that there are better options in that hood that can provide a crispier, and most importantly, spicier experience. You can find them on our Wall Of Clucks.